Brodick Castle, Island of Arran, Scotland. 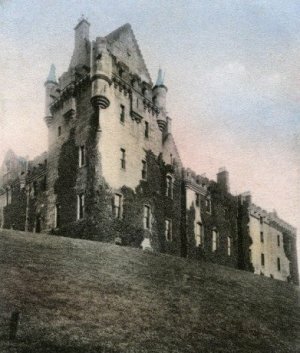 10x8 Photograph (25x20cm) Brodick Castle, Isle of Arran, Scotland, 20th century. by Heritage-Images . Brodick Castle, Island of Arran, Scotland, has had many masters including an Irish King, Norse chieftains, and a French Duke. Its long and violent history is hard to imagine as the older fortifications are now masked by the stately home designed in 1844 by James Gillespie Graham in the Scots Baronial style. Brodick however has been described with some justification as 'Britain's most war-weary castle'. It was much fought over, largely as a result of its strategic location overlooking the Firth of Clyde and much of Scotland's south western coastline. Broodick sits on a high wooded shelf at the foot of Goatfell, the ridged peak that dominates the Isle of Arran. Brodick means broad bay in Gaelic and is a reminder that the earliest known lords of the island were the Scotto-Irish kings of Dalriada in the Dark Ages. The site was later held by the Vikings, who drew their ships onto the beach below their fortress, until they were driven from Arran in the eleventh century. The first stone castle was raised by the Stewarts around 1240 but by 1260 it was in Macdonald hands. Edward Longshanks took Brodick at an early point in the Wars for Scottish Independence but it was re-captured by the Bruce in 1307. An English fleet sent by Henry IV badly damaged Brodick and briefly occupied it in 1406. Further damage was inflicted on the structure by the Macdonalds in 1455. The Hamilton Earls of Arran took possession of Brodick Castle in 1503, prompting a flurry of military modernization in the next seven years. Nevertheless, it again suffered badly at English hands in 1544 during the 'Rough Wooing' of Henry VIII. Undaunted, the Earl of Arran, now rejoicing in his French title of Duke of Chateauherault, oversaw substantial repairs the following year. During the Wars of Religion, the Campbells and Hamiltons vied for control of Brodick, with it changing hands in 1639, 1644, 1646 and 1651. A Cromwellian garrison occupied it in the early 1650s, adding a new artillery battery to cover the approaches to the castle. It now houses the art collection of the eccentric author and architect William Beckford of Fonthill. Brodick is a mysterious and much haunted place. Restoration work in 1977 exposed an abandoned staircase that led to a forgotten room, entirely contained within the thick walls of the keep. A solitary figure has been spotted sitting ruefully in the castle library, while the castle's Grey Lady is said to be the shade of a medieval unfortunate, thought to be carrying the Black Death and cast into the castle pit. A ghostly white deer grazes by the castle whenever the chief of the Hamilton family is near to death.